Hubbard Street dancers perform in the galleries during Fall 2013 UChicago Night at the Art Institute. Panelists discuss the process of adapting a classic Chinese fable to the stage during an Arts Pass exclusive trip to White Snake at the Goodman Theater. Anticipation builds as the audience waits for the show to begin; White Snake at the Goodman Theater, Spring 2014. MCA curator Michelle Puetz chats with a UC student after a tour of the Body Doubles exhibition at the MCA. Installation view of Lorna Simpson's "Chess" (2012), part of the Body Doubles exhibition at the MCA. For a few select events each quarter, ArtsPass Exclusives offer behind-the-scenes access with panel discussions or artist conversations, reduced admission, and often include receptions and free transportation. 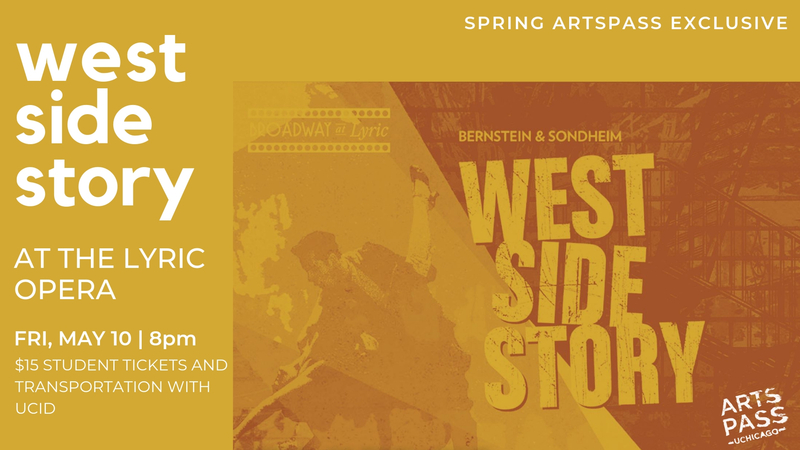 Tickets are available through the UChicago Arts Box Office up to two weeks prior to the event. Questions? Contact Grayson Wambach at gwambach@uchicago.edu for more information. $10 student tickets. Please note: There will be NO transportation provided for this ArtsPass event. 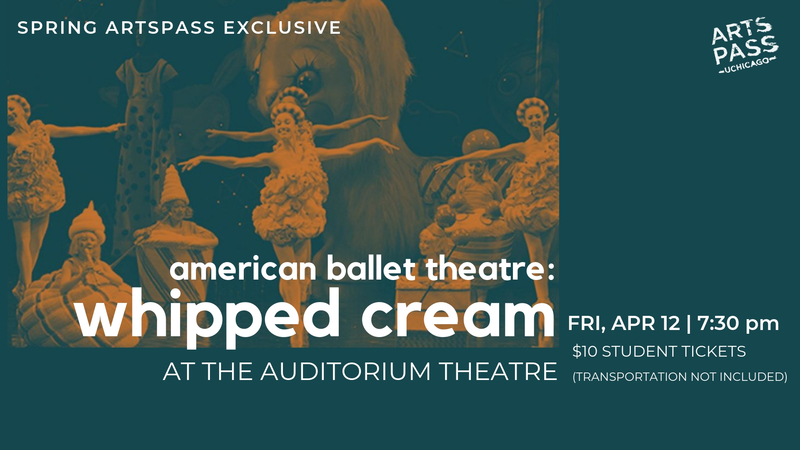 American Ballet Theatre gives the Chicago premiere of Alexei Ratmansky’s Whipped Cream on the Auditorium Theatre’s landmark stage. Ratmansky’s incredible choreography, combined with pop-surrealist artist Mark Ryden’s whimsical sets and colorful costumes, brilliantly showcases the world-class talent of American Ballet Theatre’s dancers and makes this “exuberantly nutty piece” (The New York Times) a must-see. Called “a bewitching success” by the Los Angeles Times and “visually enchanting” by The Wall Street Journal, Whipped Cream is set to a rarely-heard 1924 score by Richard Strauss, performed live by the Chicago Philharmonic. Don’t miss this rare chance to see American Ballet Theatre in this celebrated new ballet that is perfect for any lover of dance, theatre, or visual arts. Enjoy an evening at the Art Institute, admission-free. In this quarterly outing, shuttles from the Reynolds Club deliver anyone with a UCID straight to the museum. 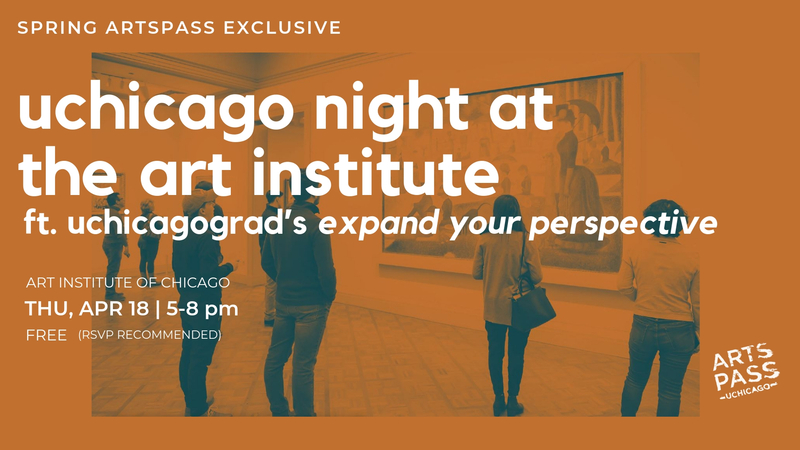 Join UChicago graduate students as they discuss their research on cultures and artworks represented in the museum galleries as part of the “Expand Your Perspective” series. Additional museum programming includes a free lecture by artist Michael Portnoy (registration required). FREE ADMISSION AND TRANSPORTATION FOR STUDENTS, FACULTY, AND STAFF WITH UCID. BUSES DEPART FROM THE REYNOLDS CLUB. $15 student ticket and free transportation with UCID. Reeling from grief, the Prince of Denmark attempts to navigate his father's death, betrayal, and relationships torn asunder. Maurice Jones will play the iconic title role in this Chicago Shakespeare Theater production. Jones has most recently appeared on Broadway in The Lifespan of a Fact opposite Daniel Radcliffe; Saint Joan staged by Tony Award-winner Daniel Sullivan; The Cherry Orchard featuring Diane Lane; Romeo and Juliet starring Orlando Bloom and Condola Rashad; and Julius Caesar with Denzel Washington, as well as credits at the Public Theater and Roundabout Theatre Company. 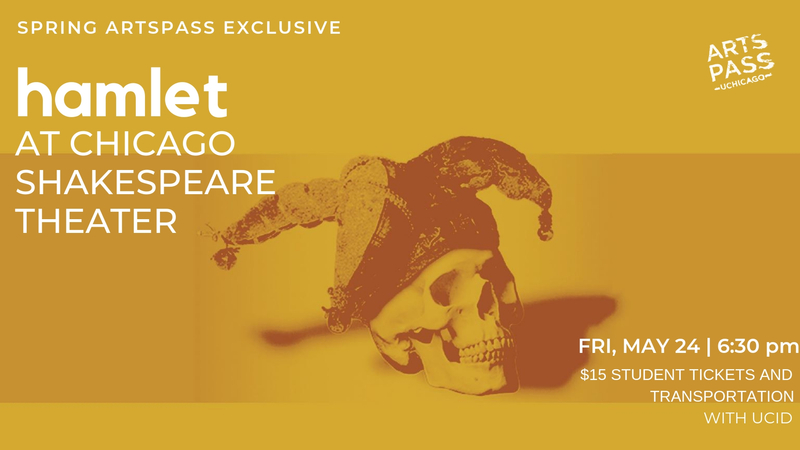 Internationally-renowned for populist and dynamic interpretations of Shakespeare, Artistic Director Barbara Gaines returns—for the first time in more than twenty years—to this enduring masterpiece that weighs the cost of deception, passion and revenge. If you have any questions not addressed in the FAQs, or would like to suggest new organizations for inclusion in the ArtsPass program, please email us.